After I cut out the pieces for my new pillows a couple weeks ago, I saw that I had the perfect amount of material left over to make some sash headbands! I saved one headband in each fabric for the girls and I, then I have two more to give away to you IF we make it to 100 likes on facebook! See the like button off to the right ====> We're so close! Just leave a comment to enter the giveaway, like the facebook page if you'd like, and I'll pick two random winners on Wednesday night (or as soon as we make it to 100)! 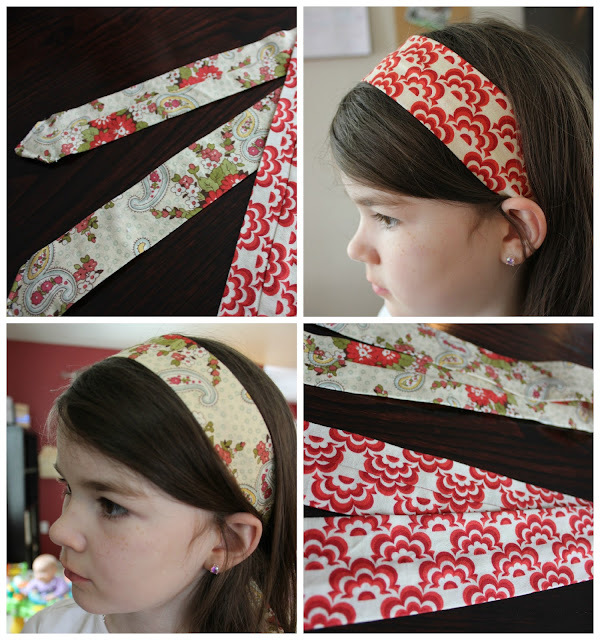 Fun headbands just in time for spring and summer! 23 comments on "Giveaway! Two headbands up for grabs!" Thanks - they're an easy way to use of those scraps! These are beautiful Amanda! What a fun idea to have a giveaway! Followed a link posted by Baruch's Lullaby on FB to your giveaway. What a beautiful family you have! Great headbands I'm sure my daughter would love. Those headbands are so cute!! You are so creative! Thanks, Leah! It's nice to be able to make something cute in just minutes. Thanks Garie! It was fun to run into your family at the pool while it lasted... :) We're done at the public pool now, and are taking lessons elsewhere for the time being. The one with the little flowers would look so pretty in Emma's hair! I just love your creativity! As always, you are one talented mama! These are so adorbs! I hope Abby wins one! Hi Amanda! I know this is a really old post but do you have a pattern for these? I don't! But I remember taking 36in X 5in strips of fabric (give or take), folding them in half and sewing a long seam (with maybe a 1/2in to 1in inseam?) then turning them inside out, ironing flat with the seam centered on the back side... then folding the ends under to form a point on both ends, then top-stitching the triangular point in place. Done! Feel free to email if you have further questions! These were so fun and easy. We still wear them.